The first comprehensive guide to one of today's most innovative approaches to environmental contamination Natural attenuation is gaining increasing attention as a nonintrusive, cost-effective alternative to standard remediation techniques for environmental contamination. This landmark work presents the first in-depth examination of the theory, mechanisms, and application of natural attenuation. Written by four internationally recognized leaders in this approach, the book describes both biotic and abiotic natural attenuation processes, focusing on two of the environmental contaminants most frequently encountered in groundwater--fuels and chlorinated solvents. The authors draw on a wealth of combined experience to detail successful techniques for simulating natural attenuation processes and predicting their effectiveness in the field. They also show how natural attenuation works in the real world, using numerous examples and case studies from a wide range of leading-edge projects nationwide involving fuel hydrocarbons and chlorinated solvents. Finally, they discuss the evaluation and assessment of natural attenuation and explore the design of long-term monitoring programs. 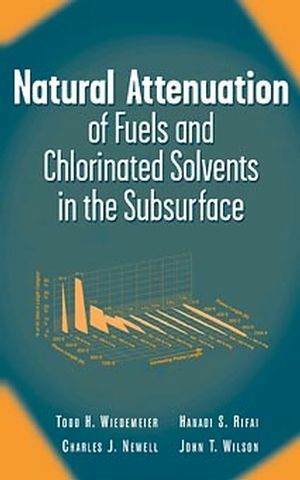 An indispensable reference for anyone working in environmental remediation, Natural Attenuation of Fuels and Chlorinated Solvents in the Subsurface is essential reading for scientists and engineers in a range of industries, as well as state and federal environmental regulators, and professors and graduate students in environmental or chemical engineering. TODD H. WIEDEMEIER, PG, is a technical director at Parsons Engineering Science, Inc., in Denver, Colorado. HANADI S. RIFAI, PhD, is an assistant professor in the Department of Civil and Environmental Engineering at the University of Houston, Texas. CHARLES J. NEWELL, PhD, PE, is Vice President and Environmental Engineer at Groundwater Services, Inc., in Houston, Texas. JOHN T. WILSON, PhD, is a senior research microbiologist. Attenuation of Source Zones and Formation of Plumes. Abiotic Processes of Natural Attenuation. Intrinsic Bioremediation of Petroleum Hydrocarbons. Intrinsic Bioremediation of Chlorinated Solvents. Design of Long-Term Monitoring Programs.